Relaxshacks.com: Tiny House Interior Design- MAKE IT FREE N' FUNKY! Tiny House Interior Design- MAKE IT FREE N' FUNKY! All it takes is some salvaged bins, apple boxes, mailboxes, tubs, dresser drawers, and anything, well "container like", and you too could build a simple storage unit like this for your budget-minded home, or wherever needed. 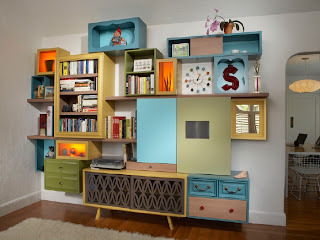 It certainly makes a statement on the creativity that can be found with simple, free, recycled materials. This particular shelving set-up was designed by Thomas Wold. I love the wildness in color and the variation of materials within- its a functional work of art. A ton of these type ideas are in my book "Humble Homes, Simple Shacks", for those newcomers who might be interested. 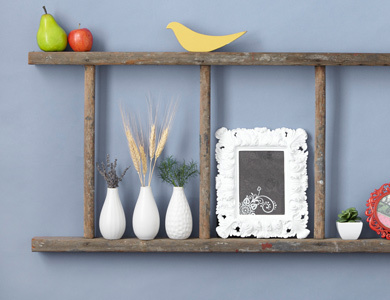 Here's a really easy old-school ladder shelf- no "making" necessary- just hang 'er up, and stack crap atop it! If you're into recycled-material building, its one of the things we'll focus on in our next (and our THIRD now) Relaxshacks.com Tiny House Building Workshop- this time right outside of Boston, MA- Nov. 2-3. More details, and a list of guest speakers will be announced. Email me if you're interested- kidcedar at gmail dot com. 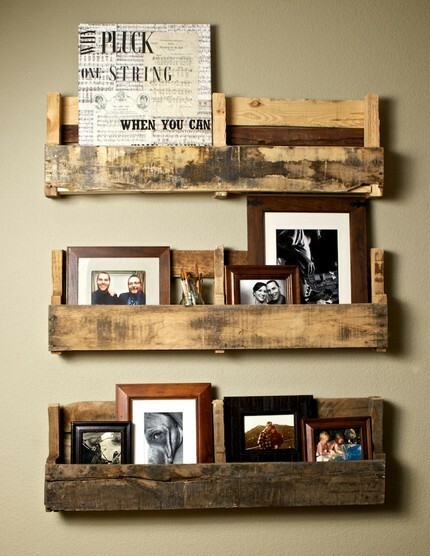 A simple hacked-up pallet-chunk, wall-mounted, shelving system. The same technique could be used for tiny flower boxes as well.